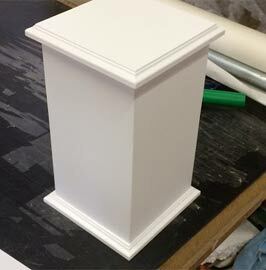 The Sign Maker for the very best in Bespoke Plaques and Memorials: We make beautiful solid wooden caskets and wooden urns for cremated ashes. 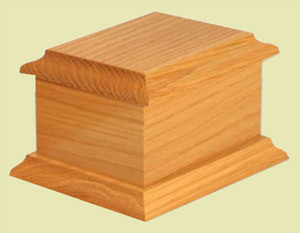 Our wooden caskets and wooden urns are designed for cremated ashes. 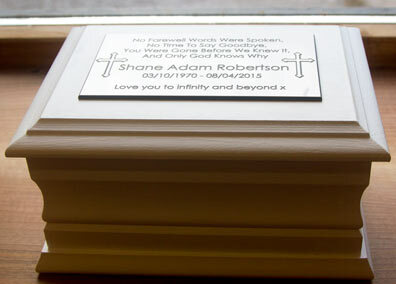 They are beautifully made from solid timber and can be supplied with or without an engraved plaque. 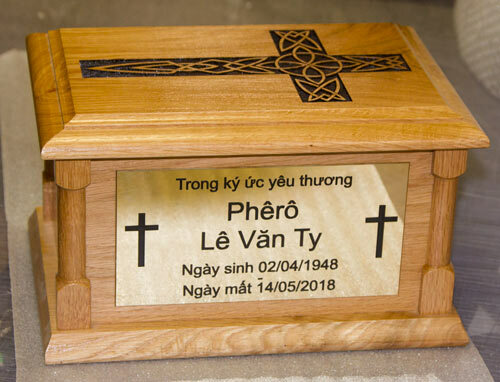 These wooden caskets are perfect if you wish to keep the ashes of a loved one, although they are also often used when burying ashes in a cemetery. They are the most appropriate type of urn for this. 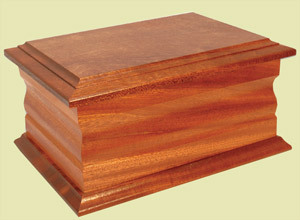 Mahogany wooden casket with shaped corners. Oak casket painted white with white acrylic plaque. 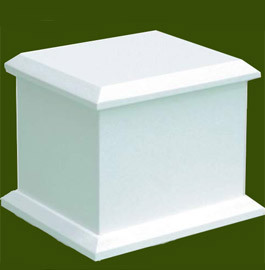 These wooden ash caskets made from solid oak, mahogany or white painted Tricoya board. They are all very attractive and have a real quality feel to them. The lids are permanently fixed and the ashes are placed into the casket from the bottom. You just unscrew the bottom, put in the ashes and screw it back on. The ashes are then always secure in the casket. 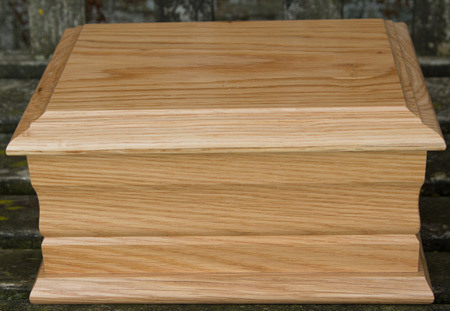 For woodland burials you may be asked for a wooden casket / wooden urn without metal screws. 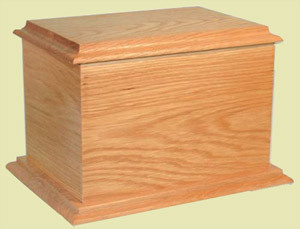 We can make a special oak casket which is fixed with wooden dowels for this purpose. We can also laser the top instead of using a plaque. 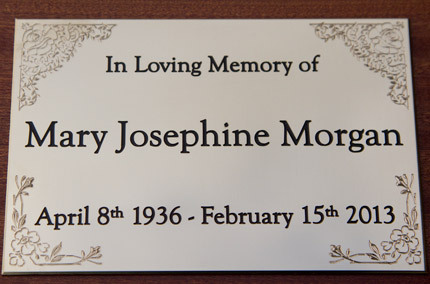 We can engrave the plaque in brass, coloured aluminium or acrylic laminate. Brass looks very smart and is traditional but does need to be polished occasionally. The anodised aluminium is available in black, dark bronze, red, gold, blue and green and requires no maintenance. The acrylic laminate is available in brass effect and stainless steel effect and again does not need polishing. The wooden urn to the right is a solid oak ash casket with shaped corners. The top was lasered with a lovely cross. In this case our customer wanted an extra brass plaque fixed to the side of the casket. As always we do or best to make it just as the customer wants. If you want something different - in this case a lasered top and an extra plaque on the side - just tell us and we will send you a quote. For the best finish, white ash caskets are made from Tricoya. This is a wood based board which is exceptionally durable. The tricoya itself has a 50 year guarantee. The paint is a tough commercial two pack paint. As well as white, we can also paint in black, Farrow and Ball Purbeck Stone (light grey) or Farrow and Ball Lichen (pale green). We can also make these painted ash caskets to order in any size - ask for a quote. Painted caskets and bespoke caskets will take four weeks to make, whereas the standard wood caskets can be despatched in two weeks. Made in the UK. 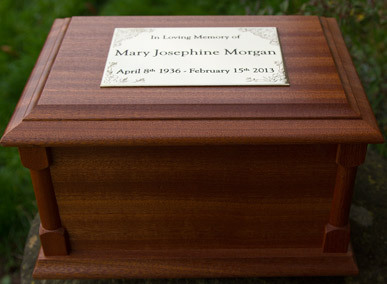 Our team at The Sign Maker looks forward to helping you with your Wood Urn or Wooden Ash Casket.